This week I brought my iPad to the Library and, as much for myself as for my students, I wanted to see what the experience of “reading” a digital book would be like. I love my iPad. I really do, but I have some reservations about it in regards to how it would change the way I read stories in the Library. Many of the complaints I’ve heard about children’s books on eReaders center around the concern over the lack of what I might call the “cuddle factor”–that ebooks are hard to cozy up to, or that all the interactivity distracts from the story. My concern (and this is partly due to the physical set up of the projector system in my library) is that I wouldn’t be able to sit in front of the students and interact with them as easily. But brave new world that it is, I decided to put my reservations aside and take the plunge. After researching a little, I decided that I didn’t want to use a book that had been simply “translated” to the iPad. I was looking for something different, something that would maximize the possibilities of the interactive nature of the technology. 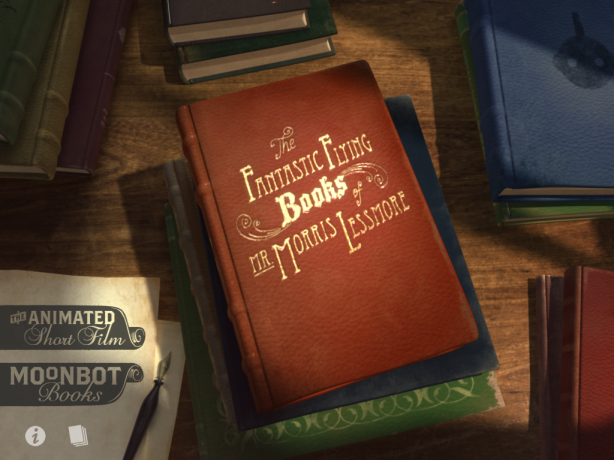 I found The Fantastic Flying Books of Mr. Morris Lessmore by Moonbot Studios. Available at the App Store for $4.99 it seemed like an easy, inexpensive investment for my experiment. I must say I was amazed. Upon first reading it, I found the interactive features smoothly integrated in the story in a way that they could add to the experience and not distract from it. But then my thoughts turned to how to present this to an entire class. Projecting it seemed to distance me from the students so I decided to let them come up, one at a time, to activate the various features after each page had been read. (There is a choice to have the voice turned off so you can read it yourself) Again, I was amazed. They were transfixed by the story, which by the way, would appeal to almost any age group. They loved coming up and making the features work and did so with very little help from me. The intuitive nature of the iPad and their natural curiosity made this possible. I asked the third graders what they thought of it. Unanimously they loved it. Then we did a visible thinking routine–Same, Same, Different–and compared the ebook to a real book. Our conclusion is that these are different experiences. One not inherently better than the other. Just different. No need to worry about books being replaced. Beautiful picture books will always have a place in a children’s library. Rather, we might look at the ebook revolution as an enhancement of the experience of literature and a choice we now have. I highly recommend the app if you have an iPad. It’s a glimpse into the possibilities of this new technology. Kindergarten–Livingstone Mouse by Pamela Duncan Edwards is the delightful story of a little mouse who sets off on an adventure to find a nest of his own. After deciding that China is his destination he is disappointed time after time until finally he finds an overturned china teapot and settles in. Each of his “mistakes” gave is a great opportunity to discuss what point of view means and why, as a mouse, things might have looked different to him than they do to us. First Grade–What makes a classic? Timelessness. This week Kindergarteners heard one of my favorite books, one I read to to my first class in 1972, one I read to my own children, and one I have read every year over the past 22 years to my students. Leo Leonni’s Alexander and the Wind Up Mouse is just such a classic. The illustrations are captivating and the story can be heard on so many levels of depth. We got a chance to practice visible thinking routines as we compared the two mice (Same,Same,Different) and we discussed how Alexander’s feelings changed from the beginning of the story to the end (Fluttering Feelings). Second Grade–Unfortunately I was sick on Monday and missed the second grade class. Fourth Grade–We played a round of “Name That Book” this week to review the various types of reference books in the library. After discussing each book, students were given clues about the contents of a book and had to decide which reference book it was. Fifth Grade–To practice a visible thinking routine–Circle of Viewpoints–fifth graders saw an online poster about Halloween (something they knew quite a bit about this week!) and after discussing it, we made a “circle of viewpoints” on the board with the question: Halloween. Is it Good or Bad? Around the questions we put lines with different people or things that might have a viewpoint about Halloween such as: parents, children, dentists, shopkeepers, farmers, and even pumpkins (!). Students then picked a viewpoint and answered the question, and stated their opinion backed up by the information from the poster. It was a good introduction to this visible thinking routine and we talked about how understanding point of view is important in fiction as well as in non-fiction and web-based research. Sixth Grade–As with second grade, sixth grade missed library this week because I was sick on Monday. This entry was posted in Uncategorized and tagged ebooks, The Fantastic Flying Books of Mr. Morris Lessmore.